Do you need Website maintenance, updates to your site, or an upgrade of any kind? 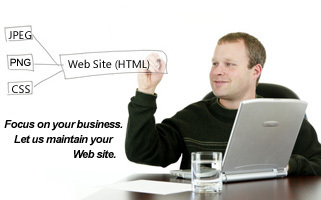 We offer professional Website maintenance, Website updates, and Web site upgrades for current clients only. We are not accepting new projects for these services at the present time. All Website maintenance services and Web site upgrades are billed at the rate of $55.00 per hour, billable in 15 minute increments. Our Website designers and programmers are highly skilled professionals with college degrees or technical school certifications. We are able to offer design, programming, and Website maintenance services at a lower cost than many companies, but we are still able to provide top-quality services due to our efficient work processes. To receive a quote for your next Website update or Website maintenance project, please send your requirements through our contact form, and we will give you a quote within 1 - 2 hours during normal business hours (Monday - Friday, 9 a.m. - 5 p.m. CST). All work is billed at the rate of $55.00 per hour, billable in 15 minute increments. All work that is requested after the project starts that was not identified in the initial quote will be billable. This includes any and all customizations and feature requests that were not specified in the initial quote. Accounts requiring ongoing Website maintenance will be billed on the fifth (5th) of each month or the following business day for the prior month's accrued billable hours. All staff member time sheet records are made available to clients through our online Project Management System. We guarantee your complete satisfaction. In addition, we will correct any errors or bugs free of charge within 30 days of project completion.